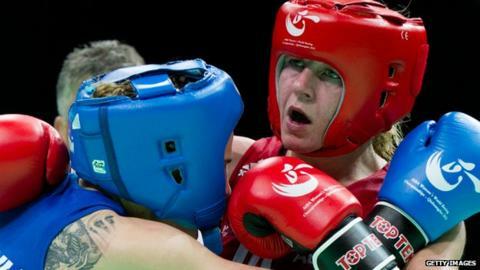 Great Britain are guaranteed two medals at the AIBA World Championships after Sandy Ryan and Lisa Whiteside both reached the semi-finals in South Korea. Whiteside, 29, won through the quarter-finals of the flyweight (51kg) category with a 2-0 win over Mandy Bujold of Canada and faces Italy's Terry Gordini. In her first senior tournament Ryan, 21, faces Thailand's Sudaporn Seesondee at light welterweight (64kg) after beating Simon Sitar of Romania. All semi-finals take place on Saturday. The pair are Great Britain's only remaining interests in the amateur tournament held in Jeju Island. "I am feeling amazing," said Ryan, who has won all three of her matches unanimously. "I know a lot of people thought that I was maybe coming here just for experience, but deep down I knew I could do something." Ireland's Olympic Champion Katie Taylor earlier reached the semi-finals and will meet China's Jinhua Yin in the lightweight division.